Following the recent announcement of the Government’s intention to remove diesel trains from the network by 2040, Keith Fender looks at how Alstom has developed a hydrogen-powered train that will lead to a trial in the UK within two years. In early November, Alstom and the government of the German state of Niedersachsen (Lower Saxony) announced the first order for 14 of its new ‘iLINT’ hydrogen fuel-cell powered multiple units. The order is worth around €90million (£80m) and includes a 30-year maintenance contract. Niedersachsen is funding €81.3m and the German Federal Government the remainder as part of a wider €250m national programme for hydrogen and fuel-cell technology. Twelve of the new trains will be built at Alstom’s Salzgitter factory (Germany) between 2019 and 2021 to operate alongside the two Class 654.1 prototype units which were showcased at the 2016 Innotrans exhibition in Berlin, and gained approval for test passenger service in late-2017. The prototypes are due to start being used on the Buxtehude-Bremervörde-Bremerhaven-Cuxhaven route west of Hamburg during 2018. Alstom has already signed letters of intent for up to 44 more hydrogen- powered regional trains with three other German states. 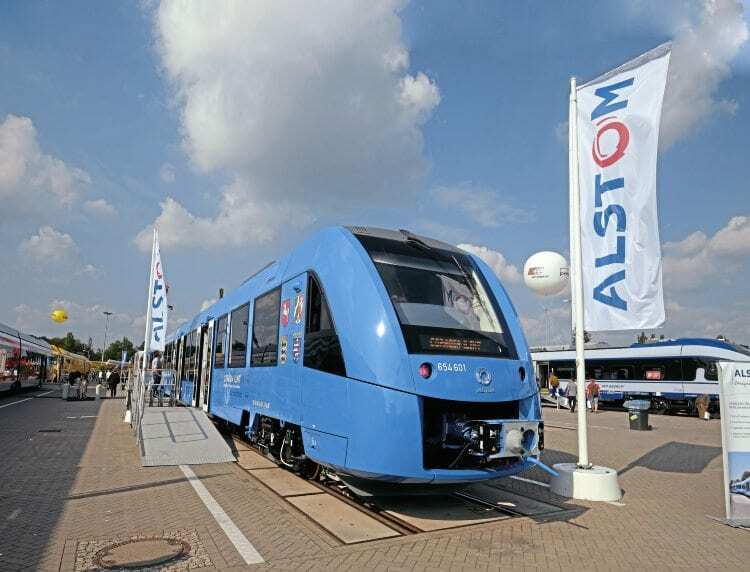 Alstom has also confirmed it is looking at opportunities to sell hydrogen-powered trains in the UK, the Netherlands, Denmark and Norway. The company’s aspirations are driven by the UK’s 3,000 vehicles, which is the second highest number of conventional DMUs in Europe (after Germany with more than 4,000). All of the countries targeted have ambitious climate protection targets in place to reduce diesel emissions and carbon emissions generally. Alstom says it is actively talking to UK TOCs, ROSCOs and DfT about bringing in the new technology, and the RSSB announced in February that it is planning a hydrogen-powered train trial in the UK in late-2019 or early-2020.